I suppose it had to happen sooner or later. Grado Labs has debuted their new iGrado headphones. They’re geared for use with iPods and as such, are smartly priced at $49. 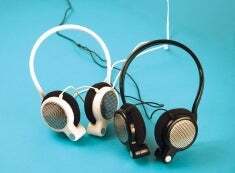 They even use the same drivers as in it’s big brother (formerly bottom of the Grado totem pole), the SR60. I’m a gigantic fan of these headphones. The sound difference is night and day for me. I may have tuned ears, but I’m no audiophile. I just know good sound. The blocking factor when I would recommend Grados were always the price and that’s no longer a problem. While they don’t exhibit Grado’s normal signature style, they’re not terribly pretty, satisfying me that they could indeed be straight out of Grado Labs.